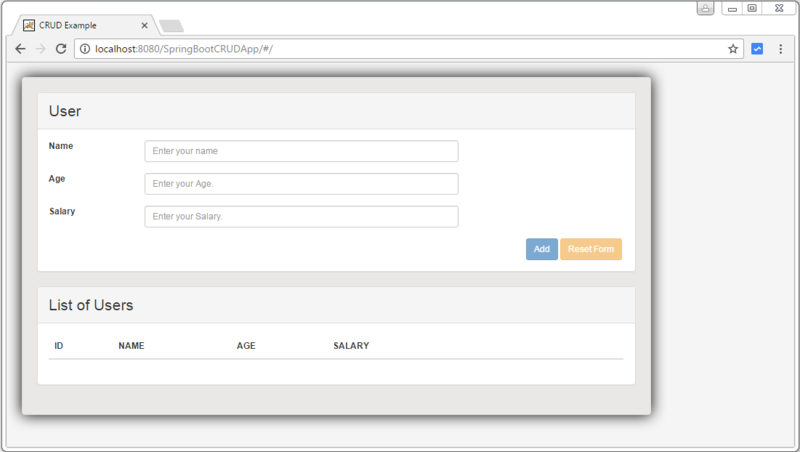 In this post we will be developing a full-blown CRUD application using Spring Boot, AngularJS, Spring Data, JPA/Hibernate and MySQL, learning the concepts in details along the way. This application can as well serve as a base/starting point for your own application. In addition, we will also use the notion of profiles to deploy the application into two different databases [H2 & MySQL] to emulate the local and production environment, to be more realistic. Let’s get going. spring-boot-starter-parent : In most of the cases[unless imported], your maven project POM will simply inherit from the spring-boot-starter-parent project. 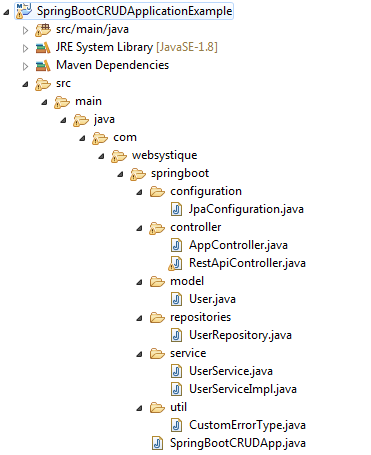 The spring-boot-starter-parent provides useful Maven defaults, provides dependency-management section so that you can omit version tags for dependencies you would need for your own project. Once inherited from spring-boot-starter-parent, you would declare dependencies to one or more “Starters” jars. 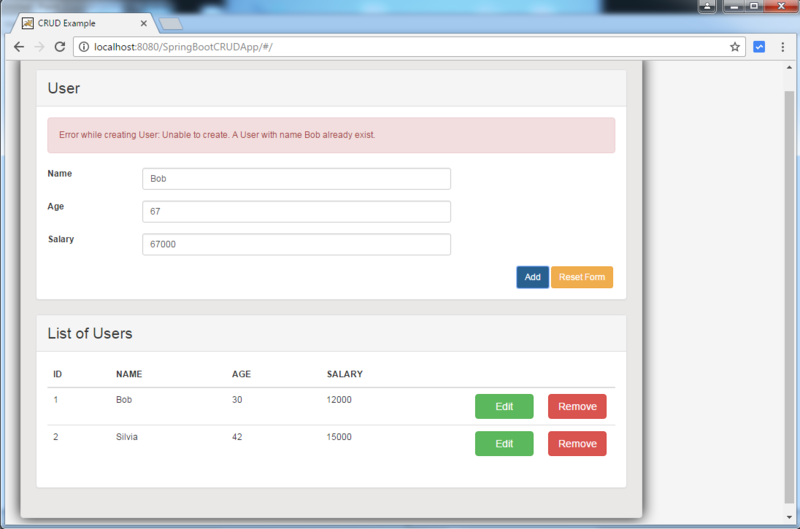 spring-boot-starter-web : Provides typical WEB MVC + Embedded container support. spring-boot-starter-freemarker : Provides freemarker template support. We will be using freemarker in this example. spring-boot-starter-data-jpa : Provides spring-data setup using JPA abstraction. Since we are talking about fast-development using spring-boot, spring-data would certainly save time compare to traditional DAO/Creteria/Query manual setup. HikariCP : Provides Hikari connection pooling support. We could have as well used Tomcat datapooling. Common DBCP is usually not recommended for performance reasons. h2: Provides H2 database support. Please note that it is used here just to demonstrate the real-life scenarios where your local setup uses one database while the one on production might be altogether a different database.Additionally, we are deliberately using a different version of h2, just to demonstrate that you CAN change the dependencies if needed. mysql-connector-java: Provides MySQL database support. Again, just because we are simulating a local[H2]-Production[MySQL] scenario. This class is annotated with @SpringBootApplication which is actually the combination of [shortcut] @EnableAutoConfiguration, @Configuration & @ComponentScan. You can choose either of them. 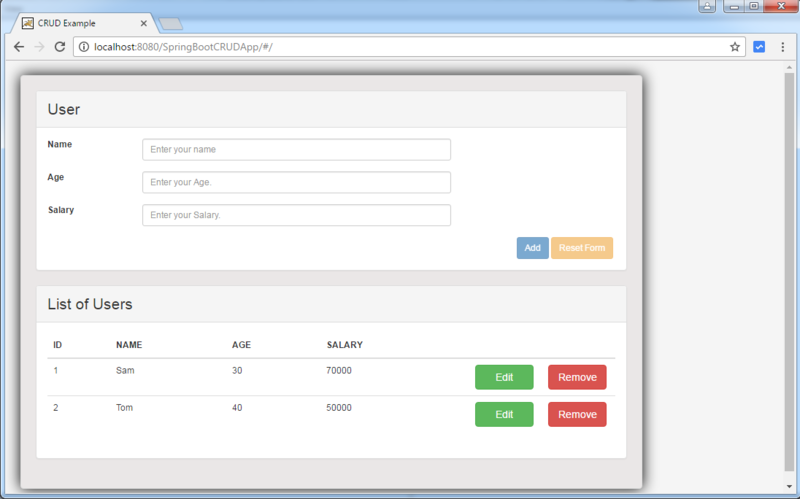 Spring Boot @EnableAutoConfiguration attempts to automatically configure your Spring application based on the jar dependencies that you have added. 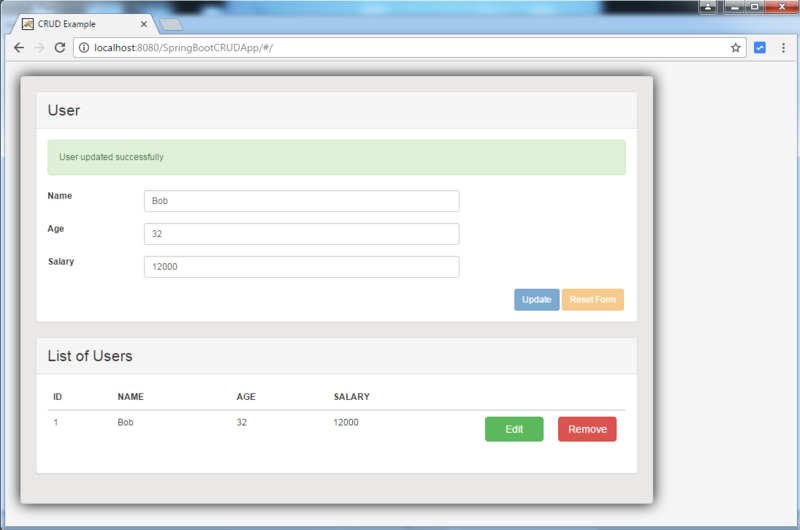 Since we have added spring-boot-starter-web, Spring boot will setup the Spring configuration for a web-application. In this configuration class, we are doing a lot: Creating datasource [using Hikari connection pooling], creating EntityManagerFactory, setting up transaction manager, referring to Spring-data repositories etc. Spring Data @EnableJpaRepositories: @EnableJpaRepositories Annotation enables JPA repositories. It will scan the specified packages for Spring Data repositories. by default, it will look into current package for Spring-data repositories. Spring Boot DataSourceProperties : DataSourceProperties is the helper class for configuration of a data source. Interesting point is that we can map the properties right from .yml files, thanks to hierarchical data. Matching-name properties from .yml will be mapped directly to properties of DataSourceProperties object. Spring Boot DataSourceBuilder : DataSourceBuilder is a builder that can help creating a datasource using the mapped properties. Additionally,if a datasource property is missing in DataSourceProperties [maxPoolSize e.g. ], we can still take the advantage of good old @Value annotation to map it form property file to actual object property. * properties of DataSourceProperties object]. * Configure HikariCP pooled DataSource. * Entity Manager Factory setup. * Here you can specify any provider specific properties. Although traditional .properties would just do fine, Spring Boot’s SpringApplication class also supports YAML out of the box provided SnakeYAML library is on class-path which usually would be due to starters. YAML is a superset of JSON, and as such is a very convenient format for specifying hierarchical configuration data. YAML file is also known as streams, containing several documents, each separated by three dashes (—). A line beginning with “—” may be used to explicitly denote the beginning of a new YAML document.YAML specification is a good read to know more about them. Since our app will be running on an Embedded container, we would need a way to configure the port and context-path for our app. By-default, Spring-Boot will use no context-path, and the default port would be 8080, means your application would be available at localhost:8080. But you can overwrite these properties by declaring them in application.yml [or application.yaml/application.properties] file. In our case, the first document [top level part, above ‘—‘ line] is the one configuring port and context path. Since we will be using profiles, we have created two separate documents each with it’s own profile. By default if no profile is specified, ‘default’ profile is used, this is standard spring behavior. You can additionally create different profiles based on your environments and use them on run. In our case, we are pointing both default and local to same profile, hence letting user to run the app directly, without specifying any profile, in that case the default profile will be used. But you are free to specify a profile. While running our example [via IDE or command-line], we can provide the profile information using -Dspring.profiles.active=local or -Dspring.profiles.active=prod in VM arguments[for IDE] or on command-line java -jar JARPATH --spring.profiles.active=local. Notice the datasource part in yml file: here we are specifying all stuff related to database. Similarly if you have other aspects/concerns [security e.g. ], you could create separate levels for that. We will be using H2 database while running under profile ‘local’ and MySQL while running with profile ‘prod’. In case you face trouble with YAML, Online YAML editor comes handy to validate your YAML. That’s it for spring-data part. Interface JpaRepository packs a punch. It provides all the CRUD operations by-default using id as the key. In case you need to lookup on a property other than id, you could just create a ‘camelCase’ signature with that property, spring-data will itself generate the implementation and execute the appropriate SQL to get the data out from database. spring-data @Query annotation goes a step further by allowing you to write the JPQL or even native SQL yourself instead of relying on spring-data to do that. One could as well extend from CrudRepository instead of JpaRepository but JpaRepository provides some goodies like paging and sorting which most of the time is needed in a FE application. Our controller will be using this service for all user-related operations. Service in turn uses our spring-data repository to access and update the user. We have two controllers in our application. 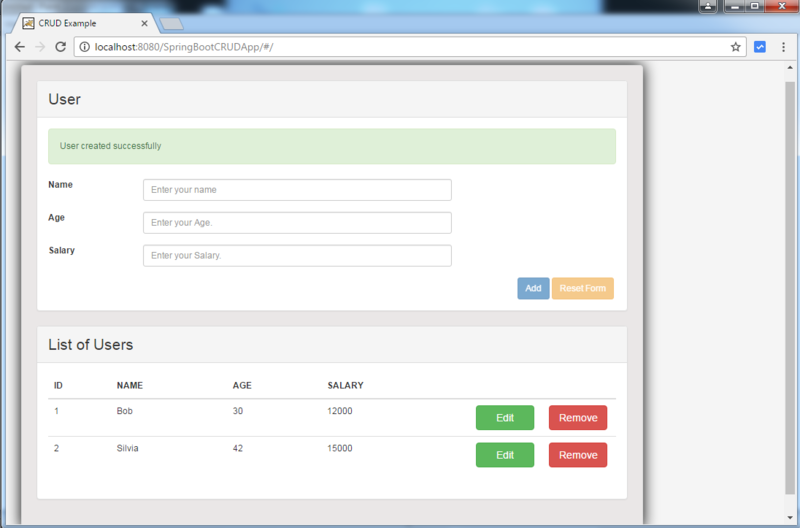 One for handling the view and other for handling the REST API calls, coming from Our AngularJS based Front-end. Additionally, a helper class to send errors [in-case any] from API in JSON format iso string. If you look back at application.yml, we have set the hibernate hbm2ddl as ‘create-drop‘ under ‘local’ profile, where as ‘update‘ under ‘prod’ profile, just for demonstration purpose. That mean in ‘local’ [H2], table will be dropped and recreated at application startup so we don’t need to create it manually. But in case of ‘prod’ [MySQL], we need to manually create the table if it does not exist. For MySQL, You can run following SQL to create table and populate dummy data. Although one can develop a complete FE using freemarker itself with tons of scripts and cryptic expressions with ‘#’ lurking around all over the page, question is should we, knowing that we are not in 1990 anymore? 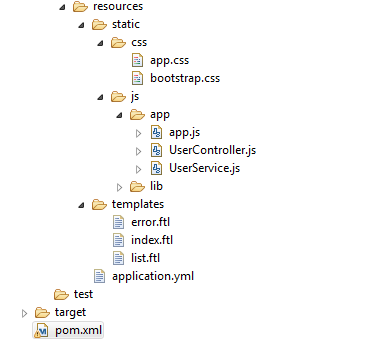 I decided to use AngularJS [with ui-router] instead, using freemarker just as a container, nothing else. Finally, Let’s run the application, firstly with ‘local’ profile [H2]. Next shot will be with ‘prod’ profile [MySQL]. Please take special note of two ‘-‘ in front of spring.profiles.active. In the blog it might be appearing as single ‘-‘ but there are in fact two ‘-‘ of them. 2016-12-26 17:15:40.786  INFO 4496 --- [           main] com.zaxxer.hikari.HikariDataSource       : HikariPool-1 - Started. Try to add a user with same name as an existing user, should get an error [this is backend throwing the error, you can change the logic on backend based on your business rules]. Reset the form.Remove a user, edit the other one. Now shutdown your app and restart it using ‘prod’ profile this time. 2016-12-26 18:58:24.110  INFO 6828 --- [           main] com.zaxxer.hikari.HikariDataSource       : HikariPool-1 - Started. Although the post was bit long, Spring Boot and associated concepts are fairly trivial. Spring Boot reduces the development time by many-fold, worth giving a try. The application we developed here is fully loaded and can be used in a live environment or as the base application for your own projects. Feel free to write your thoughts in comment section.